Last weekend I took my apprentice students on a weed walk in one of the local areas I use for wildcrafting. Hidden amongst the asters and mullein were here and there the delicate splashes of yellow belonging to the St. John’s wort (Hypericum perforatum) bloom. It is hard to look at the flower of this plant and not feel cheery. It can be no coincidence that St. John’s wort has long been used for depression, stress and pain. St Johns Wort Side Effects? Just like many other herbs recently, it has been wrongly cast into suspicion. There have been reports that St. John’s wort interacts with a large number of prescription drugs. This is true when the concentration of a specific chemical within the plant, hyperfolin, is increased beyond the normal amount found when using the herb itself. In other words, when the plant is processed into a dietary supplement that has that particular chemical added at an unnatural level, there may be problems. There is little evidence that using the plant as a food or supplement under normal use will present any problems. The flowers are traditionally picked on the Feast of St. John, around June 24. You can really pick them anytime, but this is the time of year they are typically the most prevalent. Pick the flower buds that are just about to open, or simply snip the flowers, buds and top few leaves from each plant and place them in a canning jar. I make this half a gallon at a time, but you should choose the amount you need for your family. Fill the jar and pack the plant loosely. Cover with olive oil (Be certain there is no plant matter above the level of the oil or it will spoil) and tighten the lid. Now you’re all set to put the jar in the sun for 4-6 weeks. Herbalists tend to start these preparations on a new moon. As often as possible, give the jar a shake to keep everything mixed properly. In the Mediterranean, jars of St. John’s wort are placed in sandboxes in the sun to maximize heat. I have found that too harsh for my oils, but you can experiment. 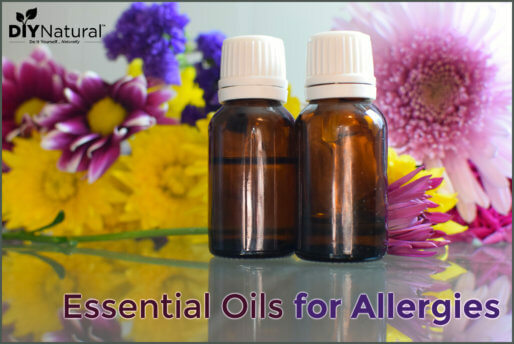 At the end of it’s time in the sun, strain the oil and store it in your medicine closet. We don’t go on a beach vacation without this oil. In fact, it is one of the main ingredients in my burn salve! Love all of your articles and have had great success with so many of them. This looks like another winner. Can I use dried SJW as I don’t grow it at present? Sorry, Sharon. You really have to use fresh St. John’s wort flowers to get the oil to come out right. If you use dried there may still be some benefit from the chemicals in the leaves… you may be able to use the oil for some minor pain relief, but you won’t get the same oil that I am talking about here. Only fresh gives you that blood red oil and there is just no substitute. Hi, nice article. SJW oil is one of my favorites that I make every year. I have infused St. John’s wort in coconut oil and it came out fine. I don’t think I noticed any differences from infusing it in any other oils. Thank you so much for that input! 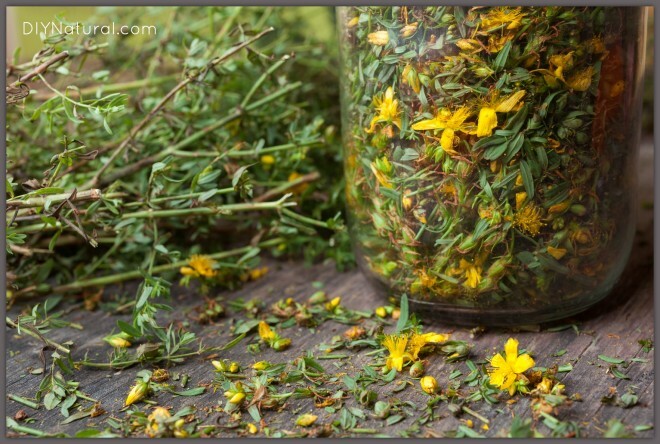 St. John’s Wort is an amazing healing herb, indeed. I use it in all my homemade medicinal salves–even in my lip balm. Just a note about using it (the oil) on burns, though. No oil should be applied to fresh burns. One should wait until the “burning” feeling is totally gone before applying oil-based salves because the oil can literally trap the burning sensation and make you feel worse. For new burns, I use aloe and/or colloidal silver (all water-based) for the first few days and then switch to a wound balm (oil-based) to finish the healing process. Great article! Just curious about your burn salve, do you mix the oil with other ingredients? For the other issues you mentioned(bruises, sore muscles, ect) I assume you just apply the oil directly? I have calendula in my burn salve… can’t remember if I also have comfrey or not, but it would be a great addition. Yes, for bruising and sore muscles you would apply it directly. Hello Dawn, I just want to thank you for your newsletter, I always enjoy and learn rrom it. They are always well written and to the point! 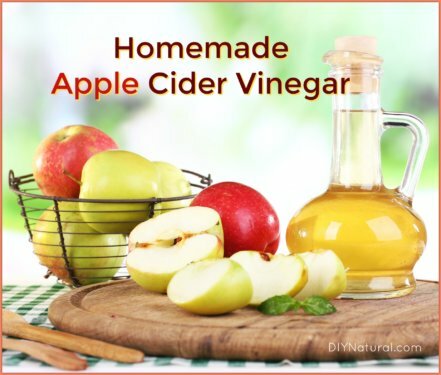 1) I have heard that after the application of this oil you should keep that part of your body out of the sun, because it makes you extra sun-sensitive, and may cause a sun rash. 2) Would coconut oil be a better base for it since it absorbs into skin faster and deeper? 1. No, there was one study that suggested that cattle that were eating copious amounts of St. John’s wort had some photosensitivity. There hasn’t really been much else to support that since. I recommend that you not ingest a lot of it and undergo UV light therapy for that reason, but there isn’t much concern applying the herb to your skin. 2. Hmmm…. I’ve never heard of anyone infusing it into coconut oil. I don’t see why you couldn’t, it’s just traditional to use olive oil. 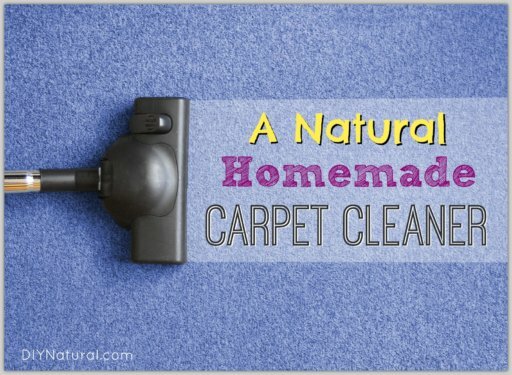 You might give it a try with a small amount of oil and see what you think. There may be some interesting interactions between the more solid oil and the oils of the plant, but it shouldn’t be anything negative. You may have to play with the ration of plant to oil but I’d have to think this through to be more specific in a recommendation. You certainly wouldn’t need the coconut oil because of absorption… olive oil has been working well for centuries. There are two main species of St John’s Wort in North America. The highly invasive European variety that restoration land managers try to eradicate is the herbal one growing rampant everywhere, and is the kind hopefully you are picking. The other St John’s Wort is native to North America , struggling to survive prairie and rarer. Please leave it alone….as its struggling to survive its European cousin…which outcompetes it. Please learn the differences and pick wisely. You could be picking the wrong one! it won’t make a difference for herbal medicines, but it will weaken an already dwindling population of native species. Note that across North America, many landowners use glyphosates on invasive St John’s Wort. Think Monsanto and Dow chemicals . This is so harmful not only to those folks picking the plants, but to the soil and the water table. This is why it is so important to include the latin names anytime we speak about plants. As you’ll see I am specific that this is made with Hypericum perforatum. The native species, here in Ohio at least, is Hypericum kalmianum. H. kalmianum does not have the same phytochemicals as H. perforatum and most likely will not make the same quality oil. It is worth noting though that there is no reason why someone need avoid picking H. kalmianum for this application as they would only be picking the flower and the top few leaves. The plant will not be harmed in the least as it is a perennial and therefore regenerates from the rootstock. It is not dependent on seed set. How long is the shelf life of this oil? I use dark amber bottles for the oils I make so I don’t know if that will help this oil prolong its shelf life or not. You should expect at least 2-3 years out of it. I’ve had it for much longer than that. You’ll know when it is no longer useable and needing to be tossed, it gets cloudy. For our family of 4, I typically make a quart jar of it once a year. We don’t have any nerve damage issues that we would treat chronically, so you should adjust up or down depending on what the needs are in your household. I too have been making St Johns Wort oil for years – best antibiotic ointment I’ve ever used – I just put the flowers in the oil and let it sit in the sunshine on my windowsill. Love watching it turn blood red. Thank you for this website. I LOVE it! Your ideas are helpful and informative and well illustrated. For example, I really appreciated the picture showing how to pack the St. John’s Wort in the jar and the cut stems left behind next to it. I am very visual and needed that. This recipe sounds great. I’m going to plant some SJW and make some oil. However, in the UK we don’t get much sun so the sandbox idea sounds good, although I don’t know how to make one. Could you point me in the right direction? You can go simple or get elaborate. All you really need is a box and a bag of sand. You should be able to get the sand at a local hardware store. Pour the sand into the box and then set out your jar of St. John’s wort and oil to soak up the sun. I have been making SJW oil for years and it always turns red. Your photo shows a bottle of oil that is not red. You are ABSOLUTELY correct! I wrote the piece, but the pictures get added in a separate step. That was my first thought as well. 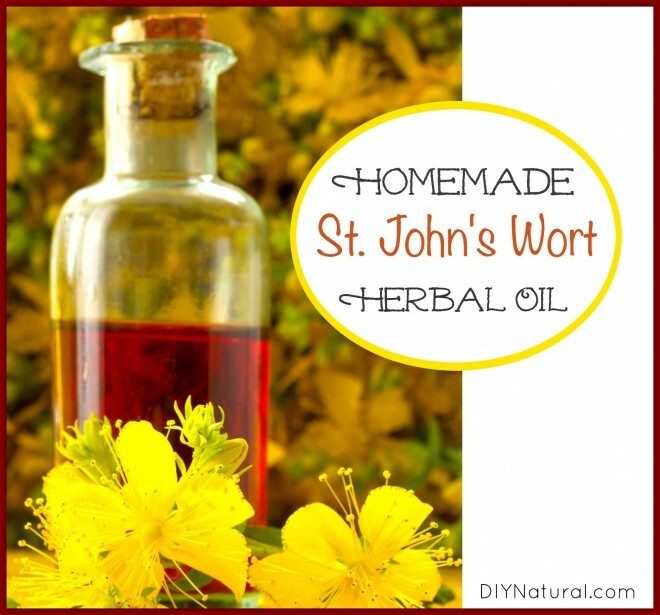 Your St. John’s wort oil is not done correctly unless it is blood red. I’ll see if it’s possible to switch the picture. The photos have been updated!